Barrow,E.M. and Hulme,M. (1997) ‘Describing the surface climate of the British Isles’ pp.33-62 in, Climates of the British Isles: present, past and future (eds.) Hulme,M. and Barrow,E.M., Routledge, London, UK, 454pp. Bohn,L. and Hulme,M. (1997) El NiÃ±os: the heartbeat of climates The World Today, December, 53, 306-309. Chattopadhyay,N. and Hulme,M. (1997) Evaporation and potential evapotranspiration in India under conditions of recent and future climate change Agric. and Forest Meteor., 87, 55-72. Downing,T.E., Ringius,L., Hulme,M. and Waughray,D. (1997) Adapting to climate change in Africa: prospects and guidelines Mitigation and Adaptation Strategies for Global Change, 2, 19-44. Hulme,M. (1997) Global warming Progress in Physical Geography, 21, 446-453. Hulme,M. (1997) The climate in the UK from November 1994 to October 1995 Weather, 52, 242-257. Hulme,M. and Barrow,E.M. 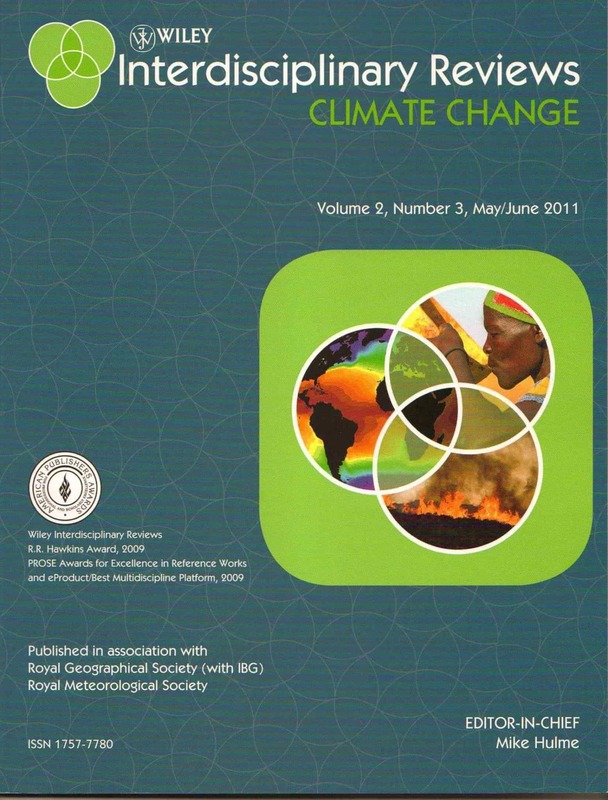 (1997) ‘Introducing climate change’ pp.1-7 in, Climates of the British Isles: present, past and future (eds.) Hulme,M. and Barrow,E.M., Routledge, London, UK, 454pp. Hulme,M. and Barrow,E.M. (eds.) (1997) Climates of The British Isles: present, past and future Routledge, London, 454pp. Hulme,M. and Kelly,P.M. (1997) ‘Exploring the links between desertification and climate change’ Chapter 15 in, Environmental management: readings and case studies (eds.) Owen,L and Unwin,T.B.H., Blackwell, Oxford, UK, 448pp. Hulme,M. and New,M. (1997) The dependence of large-scale precipitation climatologies on temporal and spatial gauge sampling J.Climate, 10, 1099-1113. Jones,P.D. and Hulme,M. (1997) ‘The changing temperature of ‘Central England” pp.173-195 in, Climates of the British Isles: present, past and future (eds.) Hulme,M. and Barrow,E.M., Routledge, London, UK, 454pp. Osborn,T.J. and Hulme,M. (1997) Development of a relationship between station and gridbox rainday frequencies for climate model validation J. Climate, 10, 1885-1908. Raper,S.C.B., Viner,D., Hulme,M. and Barrow,E.M. (1997) ‘Global warming and the British Isles’ pp.326-339 in, Climates of the British Isles: present, past and future (eds.) Hulme,M. and Barrow,E.M., Routledge, London, UK, 454pp. Viner,D. and Hulme,M. (1997) The Climate Impacts LINK Project: applying results from the Hadley Centre’s climate change experiments for climate change impacts assessments Climatic Research Unit, School of Environmental Sciences, UEA, Norwich, UK, 17pp.